The production capacity of 150 TPH- 200 TPH Stone Crusher Plant is popular in the world for the contractors and final users. The 150- 200 TPH jaw & impact crushing plant, jaw & cone crushing plant are designed for medium scale stone quarrying plant, aggregate plant, mineral beneficiation plant and so on. As a medium scale crushing plant, the jaw & impact crushing plant is widely used to produce building aggregate and construction aggregate. SBM 150 TPH- 200 TPH Stone Crusher Plant are designed with ZSW-420X110 Vibrating Feeder, PE-750X1060 Jaw crusher, PF-1315 Impact crusher, 3YA2160 Vibrating screen. SBM design this stone crusher used for aggregate crushing, gold processing, construction building materials production. 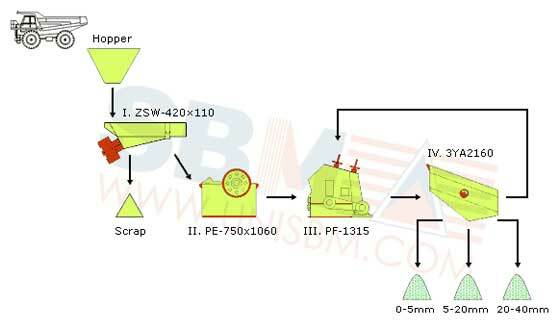 According to the raw materials, SBM can special 150 TPH- 200 TPH Stone Crusher Plant, such as aggregate crushing plant, gold processing plant and sand making plant. Small scale stone crushing plant of 150 - 200TPH manufactured by SBM Machinery is widely used in building aggregate, construction aggregate production.